5 on Friday: Dry Rosé Cider, My Fav Sweater and More! Happy FRIIIIIIDAYYYYYY y’all!!! I gotta say, and I never ever want to wish time away when I have a baby girl that changes every single day, but gah y’all I’m happy it’s Friday. TGIF. Luckily we have a relatively unplanned weekend ahead to spend time with our girl and get the last few big things we need to get done finished around the house to feel settled. So today I’m going to kick it off with a little Five on Friday, something I haven’t done in awhile and I’m so happy to bring it back. A new offering from Candlefish! Y’all have heard me obsess over Candlefish in the past with this post and now they even have a partnership at Anthropologie. Plus, the ladies of Southern Charm are even fans. I joined fellow bloggers this week in downtown Charleston at their studio to make some candles, mingle and hear more about an exciting new offering coming soon! I can’t wait to share more, but for now I’ll leave you with this picture of these gorgeous friends! Make sure to visit Charleston Shop Curator, Coastal Bride and Charleston Weekender who are with me above! Rosé Cider. Yep, you read that right, I found this Wolffer Dry Rosé Cider at Whole Foods this week and I’m pretty obsessed. It’s definitely sweeter, but the cute little bottles and the fun branding make it the perfect treat for my basic babes out there. Always a good hair day. Not even gunna lie, I saw this photo that my amazing hair guru (stylist just didn’t feel right), Lex, texted me last night and I had to asked, “Is that MY hair?!”. Haha! Talk about a good hair day, so in love with my updated locks. It just feels so darn awesome to get your hair did, am I right?! Our new dining room table! If you follow me on Snapchat (name: ephilli) you know that we love to frequent the Celadon Sunday Flea and on our last trip we found this beauty. I loved how wide it is and it even has a built in leaf that pulls up through the middle when you maneuver the levers underneath. Still trying to decide on those barstools you saw here, now I need to decide on some dining chairs as well… any suggestions? 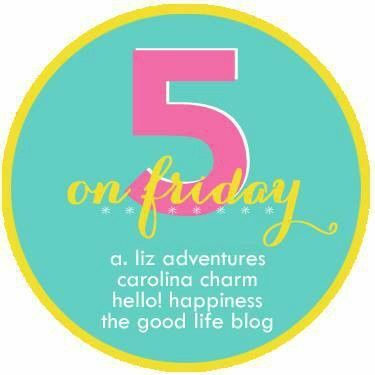 Linking up with A. Liz Adventures, Carolina Charm, Hello! Happiness and The Good Life. Surprise! Adding in a bonus item to this post because this popped up on my Timehop and how could I not share this adorable little fall baby. Absolutely mind-blowing what a difference a year makes! See all the photos in this post on Sully’s 6-month mini session with Allison Shumate. Last Minute, Easy DIY Flamingo Halloween Costume!